Available to participants at the Meek level and beyond. 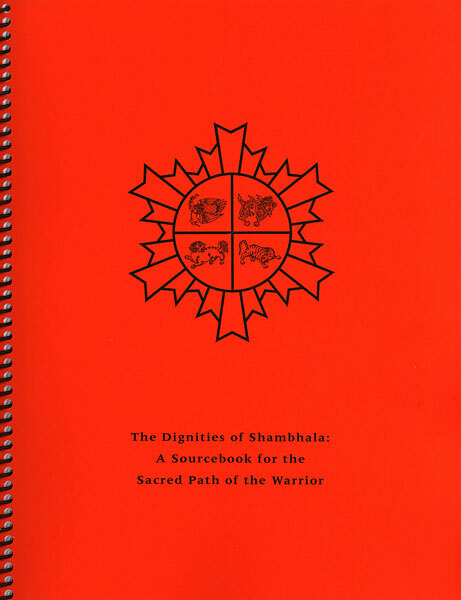 A Sourcebook for the Sacred Path of the Warrior. This is a collection of all the direct commentaries by the Dorje Dradul, Chogyam Trungpa Rinpoche, on the four dignities; Meek, Perky, Outrageous, and Inscrutable. They are organized according to the levels of the Shambhala Training Sacred Path program. These talks were given in three series in 1978. The first, later to be referred to as the "Meek Series," were given at meetings of Shambhala directors-in-training held twice a week in the form of very personal and almost informal conversations at the Shambhala Center in Boulder. In the summer the Dorje Dradul gave a more formal series of talks on the dignities at the same location. In October 1978 he gave two of the talks included here at the first Kalapa Assembly, held in Snowmass, Colorado. These came to be known as the Letter of the Black Ashe I and II. 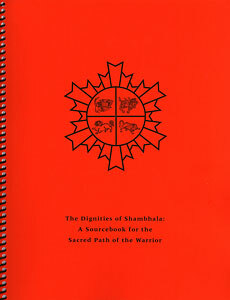 All the talks have been lightly edited and adapted for use in the Shambhala Sacred Path program.